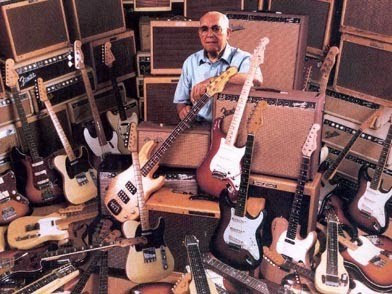 Clarence Leonidas "Leo" Fender (August 10, 1909 – March 21, 1991) was an American inventor who founded Fender Electric Instrument Manufacturing Company, or "Fender" for short. He left the company in the late 1960s, and later founded two other musical instrument companies, MusicMan and G&L Musical Instruments. The guitars, bass guitars, and amplifiers he designed from the 1940s on are still relevant: the Fender Telecaster (1950) was the first mass-produced electric guitar; the Fender Stratocaster (1954) is among the world's most iconic electric guitars; the Fender Precision Bass (1951) set the standard for electric bass guitars; and the Fender Bassman amplifier, popular enough in its own right, became the basis for later amplifiers (notably by Marshall and Mesa Boogie) that dominated rock and roll music. 991 – Battle of Maldon: the English, led by Byrhtnoth, Ealdorman of Essex, are defeated by a band of inland-raiding Vikings near Maldon in Essex. 1512 – The naval Battle of Saint-Mathieu, during the War of the League of Cambrai, saw the simultaneous destruction of the Breton ship La Cordelière and the English ship The Regent. 1519 – Ferdinand Magellan's five ships set sail from Seville to circumnavigate the globe. The Basque second in command Sebastian Elcano will complete the expedition after Magellan's death in the Philippines. 1557 – Battle of St. Quentin: Spanish victory over the French in the Habsburg-Valois Wars. 1792 – French Revolution: Storming of the Tuileries Palace – Louis XVI of France is arrested and taken into custody as his Swiss Guards are massacred by the Parisian mob. 1861 – American Civil War: Battle of Wilson's Creek – the war enters Missouri when a band of raw Confederate troops defeat Union forces in the southwestern part of the state. 1993 – An earthquake measuring 7.0 on the Richter Scale hits the South Island of New Zealand. 2003 – The highest temperature ever recorded in the United Kingdom – 38.5 °C (101.3 °F) in Kent. It is the first time the United Kingdom has recorded a temperature over 100 °F (38 °C). 2009 – Twenty people are killed in Handlová, Trencín Region, in the deadliest mining disaster in Slovakia's history.